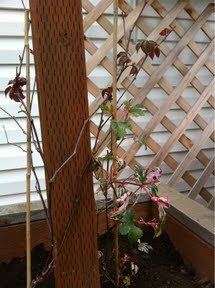 I planted four vines under our pergola today, they are very pretty. I'm looking forward to seeing them grow, twist, connect, and run all over our pergola. The chapter I read this morning was John 15, He is the Vine, we are the branches. God has often led me to this chapter, His way of gently reminding me whose in charge. Without being connected to Him I can do nothing at all. Without Him, I will be fruitless. "I am the Vine, you are the branches. When you're joined with me and I with you, the relation intimate and organic, the harvest is sure to be abundant." He reminded me again to love others the way He loves me. To put my life on the line for friends, and to keep His commandments. He says that He chose me and has put me here in this world to bear fruit for Him. The Vine, it is strong, beautiful, and it is deeply rooted. It hold steadfast to the branches. So, throughout this day I have thought of this chapter and continually prayed to be a strong branch IN Him. To be fed by The Vine, to stay alive, vital, and complete. Say That to me again, Jesus. In You I am alive, vital, and complete, because YOU are The one and only true Vine.